The referendum in Greece on Sunday is not only about a decision on whether to exit or stay within the eurozone by a struggling European country; whether the majority of the Greeks decide to vote in the affirmative or not in Sunday’s referendum, the referendum itself will turn a page in history by laying the foundation for refashioning the democratic social contract between the citizen and his or her government in the 21st century. The modern government as we know now is premised on two basic principles: only those governments are legitimate who rule by consent of the people and not the whim of a monarch; and exercise power as a trust and not as a divine right in the interests of the people. If a government violates these principles, the citizen has a legitimate right to overthrow the government through elections or in extraordinary cases through civil disobedience. Modern governments perform two functions to maintain their legitimacy: create prosperity for its citizens (liberty) and justly distribute that prosperity (equality) and in return the citizens follow the laws and help the governments maintain order. These two principles have been epitomized in two forms of governments over the last century: free market democracy and authoritarian socialist republics respectively. The last century saw the triumph of market democracy over authoritarian socialism. But this defeat was primarily political rather than economic. That capitalism creates a concentration of wealth on one pole and poverty on the other pole is accepted by even the most enthusiastic advocate of free market democracy. The open market created unprecedented wealth for its adherents in the last century; however, the free spirits of the market were tamed by a redistributive welfare state – Roosevelt’s new deal and Johnson’s great society – human rights, labour unions, healthcare but most importantly, democratic accountability and free speech. The people decided their fates. They mattered. Whereas, the Soviet Union – although it countered poverty and ended monarchy in Russia – degenerated into a massive, opaque, authoritarian bureaucracy where the “party” had supplanted the “people” in whose name it ruled and a small unrepresentative party elite controlled the fate of the people. As a result, when a major economic – political crisis mounted in the late 1980’s the people overthrew the illegitimate ruling elite and the Soviet Union was dissolved. This ushered in an era of global market fundamentalism; a trend which had been championed decisively by Reagan and Thatcher in their respective countries since the 1980’s. The political defeat of Soviet Union was taken as a decisive negation of all arguments for equality and justice. Under a world dominated by the US, global lending institutions were set up which through conditional debt – structural adjustment – to struggling economies forced their markets open and imposed Reaganite economic paradigms the world over. These economic assumptions were: having a free market with minimal government intervention promoting privatization, maintaining low fiscal deficits and adopting an export-oriented growth model. These became political and economic common sense, globally. Even minimal state regulation was scorned upon. It was not the business of the government to be in business, as Thatcher said. An unelected technocratic elite of global lending institutions pushed these tenets as gospel truth. A sort of economic absolutism was in vogue and a culture of “greed is good” prevailed. The vacuity of these claims was exposed when none of the adherents of Reaganism could either predict or explain the global financial crisis, which ruined lives of millions in the developed world. Reaganism has created unprecedented polarization of wealth where the top 1% has obscenely more wealth and political influence than the rest of the 99% combined. No one was held accountable for the global financial crisis caused by greed of the bankers on wall street; the top one per cent. If no person was held accountable for such economic ruin, it was in a strange way accepted by governments that this was a systemic crisis. Reaganism smashed the welfare consensus which defeated the Soviet Union and most importantly hampered upward mobility – the holy grail of capitalism – as Thomas Pikketty has proven. While people still got to vote once in five years; the MNC’s funded both sides of the political divide. It was a choice between two factions of the big capital; the choice was not real. In the wake of the crisis, US and UK gave their economies a liberal dose of deficit spending and slowly but surely recovered from the recession. However, the fact that the euro zone was a fiscal union meant that states could not devise autonomous fiscal policies and as an EU member, it was required to limit its fiscal deficit, hampering the chance of its recovery. A harsh austerity regime was imposed on these countries when they asked for loans to these multilateral banks. This tore down the State and debilitated the society in Greece. This is of course not to argue that the Greek state was not corrupt or did not have problems of governance or was not running unmanageable deficits; but that this imposed regime of austerity precluded any chance for a viable recovery. The rich are not affected by the cutting of welfare spending; the poor and the middle classes are. The 1% created the crisis and passed off the effects on to the 99% of the people. Nobel laureate Amartya Sen argues that there are two misnomers about deficits in neoclassical economic thinking: (1) That austerity will lead to a recovery from a recession, for that one needs growth and (2) National debt is not like a personal debt as Reaganites like to believe. It can be managed because it is owed to its own people. However, we have a case where we have witnessed enormous unemployment and shrinking of economies across Europe not only Greece; but Spain, Ireland, Italy and Finland. The Greek case has been the most devastating, where after agreeing to impose austerity suggested by IMF, there GDP contracted by 25% and unemployment shot up. These austerity measures have only helped the banks and not the people. In fact, out of the last installment of the Greek bailout money only a pittance reached the people, the rest bailed out banks. The deal being offered now will be more of the same. Again the choice is not real. The wheel of history had come full circle. A tiny, unelected, unrepresentative elite – of global financial banks – was calling the shots again; peddling a dogma again. The dogma had changed its colours. It was no longer red. It was wrapped in the banner of liberty. People once again did not matter. What mattered was the Reaganite economic dogma which had caused the crisis in the first place. It is in this context that there have been seismic changes in the political landscapes of Greece and Spain where Left-leaning, populist and anti-austerity coalitions have gained huge popularity. In the election in 2011, the Social Democratic Party of Spain lost 40% of its support. Similar fate befell PASOK, the social democratic party of Greece which lost 30% of its vote between 2009 and 2013. This was the level of anger of the common people against the elites represented by these parties. They were being punished for the mistakes of the 1% who caused the recession. Imposition of austerity measures only reiterated that they did not matter. However, this Left, as Pablo Iglesias the leader of Podemos said, starts off by acknowledging the failures of Soviet Communism. Their primary goal is to make democracy work again; power does not flow from the barrel of the gun for these parties but through the voices of the people. In short, people matter, not profits or at least people matter before profits. For both these parties, people’s participation and democratic deliberation are at the centre of their visions of socialism. They want to be mediums through which people can speak out against the unrepresentative technocratic elites of the EU and IMF. This is a decisive break from the 20th century Stalinist party supplanting the people themselves. For years now, democracies have been perverted by money power and vested corporate interests. In Greece we have a case where a nation has been robbed of its sovereignty by global institutions. It is no longer about the debt as an IMF report attests the claims of the Greek government that the debt is unmanageable and needs to be restructured if it has to be repaid. Then why is such obstinacy being displayed in the face of a massive humanitarian crisis by the EU? It is about preserving the economic status quo, which favours the multinational corporations which have for long swayed political systems across the world in their service. It is here that the referendum becomes a seminal moment in history. The Leftist Prime Minister Tsipras does not need to go to the people to withdraw from the euro zone. He has the authority as the elected PM of the country to take that decision through his cabinet. But he is putting this up to the Greek people to deliberate and participate in a decision which has a bearing upon their lives. In other words, he is re-seeking legitimacy because he has not been able to renegotiate the debt with the troika, which was the mandate he was given by the people. This act of seeking a referendum is the first step in refashioning the social contract; redistribution not through the gun but through enabling the voices of the people to be heard. Democracy is beginning to be more than voting once in five years. 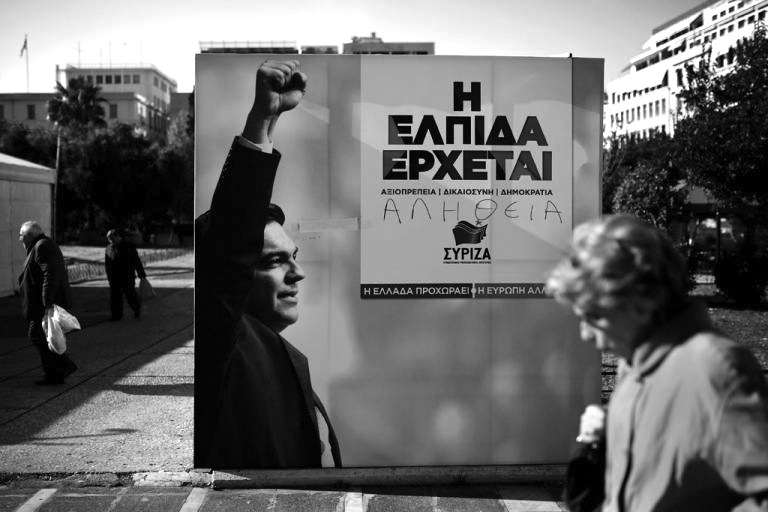 Syriza has turned the page on the 20th century decisively and arguments of equality have replenished their legitimacy. The Reaganite consensus is under attack. It is accepted that although markets create prosperity; they have no inherent moral compass. The people are speaking back to an unelected technocratic Reaganite elite who have supplanted them much like Soviet Era technocrats. Tsipras might win or lose; but the social contract between the citizen and the government will never be the same again.